If you believe the lore, AC/DC was booed from the stage while opening for Aerosmith at Selland Arena in 1978 and didn’t return to Fresno until they played the Save Mart Center in 2009. In actuality, the band returned to the city in 1979, playing the Warnors Theatre on the “Highway to Hell” tour. The Youtube channel AC/DC Damnation has the video footage. The English punk band led by Joe Strummer was on its “Out of Control” tour when it stopped at the theater Jan. 28, 1984. The band was touring with a new lineup, one without guitarist Mick Jones, according to the site Classic Rock. Still, the show left an impression on a generation of Fresno rock fans. The rock band from Athens, Georgia, played Warnors on July 19, 1985 on its “Reconstruction” tour. 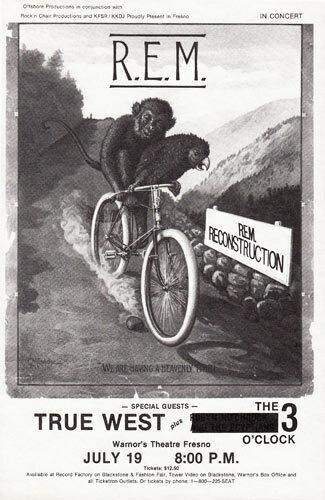 The concert was promoted in part by the radio stations KFSR and KKDJ, according to a handbill for the show. The year before, the band opened its “Little America” tour at Fresno’s Star Palace, according to REM Timeline.com. It would be another two years before they released hit song “End of the World as We Know It” and a full seven years before “Everybody Hurts” ruled MTV. The jazz trumpeter was late in his career when he played the Warnors Theatre in 1990. He died the following year. Reviews on the show — a single two-hour set with 12 numbers and no intermission — were mixed. A review in The Fresno Bee called it legendary. Stephanie Carter, in a letter to the editor, was less impressed. Neil Young gave his fans a surprise when he announced a series of concert dates at the Warnors Theatre earlier this year. The three-night run of concerts marked the first time Young had played with his backing band Crazy Horse in four years and was presented without rehearsal. The shows became extra special when it was announced Nils Lofgren would be sitting in on guitar.